I have something different this week. It’s a bit of a parable. A friend of mine recently shared a video on her facebook page of two black violinists playing to hip hop beats. At a talk I attended last year by Dr. Soong-Chan Rah. At one stage he made the point that we’ve given the descriptor “classical” to Western European music most popular starting in the 1600’s. All other musical genres from other cultures and times are given different descriptors that often indicate they are something less than “classical”. I have a stereotype in my mind of what violinists look like. And it’s something much more like this video that was shared with me on facebook than the previous duo. They’re white. They’re women. They’re wearing evening dresses. And even though they’re clowning around and playing popular tunes they more closely fit the image I expect. But I’m also forced to face my own violin prejudice. Within the predominantly white culture there’s also the decidedly non-classical genre of fiddle playing. No one looks at a fiddler and says, “That guy has talent. What a shame he’s not part of a philharmonic somewhere.” There’s a willingness to accept this folk music style as a distinct genre because we recognise its roots. We face a couple of challenges when we consider these different styles of violin performances. 1. Can we value each style for its unique traits, or do we feel an urge to rank them? 2. Would it be possible to host a concert with all these artists performing together? Would the musicians need to make adjustments in order for the concert to appeal to the entire audience? Would they be willing to make adjustments? Would the crowd give each group equal attention and respect? Sadly, churches often want to make newcomers from other cultures worship and serve in a style preferred by the majority culture. This attitude is most often unthoughtful, but it communicates a lack of respect for the talents and values of the minority culture. This is why it’s so important for congregational worship to reflect the values and preferences of all cultures if the church is to grow. It’s also why it’s so difficult to change the existing pattern of worship. What do you think? Is this helpful? What are the strengths and weaknesses of comparing these violin genres to multi-ethnic churches? My discussions on this blog usually revolve around issues related to churches with a mix of black and white members, because that is where I live. On Sunday I had the opportunity to attend an Interfaith Roundtable Discussion hosted by the local Turkish Cultural Center and a local Synagogue. The Turkish Cultural Center only moved into the neigbourhood a year or so ago. The arrival of a Muslim organization raised a few eyebrows among people I talked to. In about August I made the decision to introduce myself and spent an hour or so talking to the director of the Peace Islands Institute that the TCC sponsors. Peace Islands is like a public relations branch that seeks to facilitate dialogue with groups who only know Muslims through what they see on the nightly news. As a result of that visit I am now on their email list and receive invitations to their various community events. This was my first opportunity to attend. 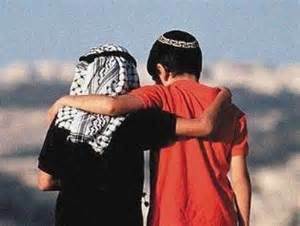 Have you greeted people of other faiths on their holidays? How did you feel about it? Do you know and follow your own religious practice whether it promotes or limits well wishes? At the work place where people are of different faith groups, do you eat together and join conversations? You are watching a game in a public place where there are people from other faith groups, and some of these people support your team, how do you interact with them during that time? Do you share your excitement with them? Does your or their attention shift to a curiosity about what you are, or what they are? How do you manage/strategize your communication on social media? Are there moments you are being offended or you think it is offensive? How do you handle it, react to it? What I appreciated about this process is that it focused upon the common ground between Muslims and Jews. In this way they could learn from each other. They are each minority religious groups within American culture. They each have distinct religious dietary restrictions. They each have holidays unique to their religion/culture. They each often feel like they live in a hostile environment. Most members of each group are first or second generation immigrants. Many members of each group speak English as a second language. Does it surprise you to consider that Jews and Muslims in the U.S. share so many experiences? Are you amazed that members of these two religions can sit around a table and share experiences and learn from one another? The TV talking heads would have us believe the two groups should be firing rockets at each other. Of course, I imagine that there are topics of conversation that would raise the heat in the room, but it’s impressive what can be accomplished when we decide to focus on what we share in common rather than our differences. I believe that churches can learn a lot from this process. I’m not suggesting that we should sweep all differences under the rug, but most often when the proliferation of mono-racial churches is discussed, all I hear are the differences: race, culture, worship style, preaching style, food…. We need to find ways to remind each of our common ground, our holy ground, without sacrificing our cultural identities. The above map purports to show each person identified in the USA through the 2010 census. If you click on the map above you’ll go to the original site that allows you to move around and zoom in on your community. This isn’t really the typical material promoted on this blog, so let me explain. I suspect that most churches have little concept of the racial makeup of their community. We often function based upon our impressions as we shop and drive through the neighborhood. Perhaps particular parts of our towns and cities have reputations for having a lot of residents from a distinct culture. The risk with functioning based upon impressions is that appearances can easily deceive us. Yes, the majority of our neighbourhood may well be black or white, but the apartment complex down the road may have a large Indian population. We may not see many Indian restaurants or businesses because while the live in our neighbourhood, they work and shop elsewhere in the city. Churches can’t serve our communities effectively, if we don’t know who lives in our communities. Really knowing our community requires research and asking questions. So I submit the map above as a starting point. Zoom in on your city and see if it matches your impression. Did you find any surprises? Please leave a comment and share your thoughts. This week a friend shared an article with me about university marketing. It told the story from 2000 when the University of Wisconsin wanted to portray itself as racially diverse in its recruiting material. Somebody had the bright idea that Photoshop would help them out. So the front cover of the 2001-02 application booklet features a scene from a football game with the photoshopped head of a African-American student who never attended a football game! This illustrates the difficulty institutions such as colleges and churches have when portraying themselves. Unless a church is targeting a particular demographic sector such as young professionals, or a specific immigrant community, churches want to portray themselves as welcoming to everyone. As a consequence our websites and promotional material often emphasises diversity. However, these pictures don’t always tell the truth. The difficult question to answer is “Should we portray the church accurately, or aspirationally?” How does a 98% white church communicate that black and Hispanic members are welcome? Does a picture of a room full of white faces communicate that message? But if a church posts a stock photo of great racial and generational diversity that’s not a current reality will guests feel deceived when they walk in the door? 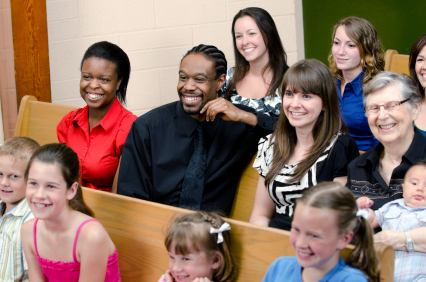 Look at this picture I found in some search results for “church diversity”. It’s obviously staged, but they’ve managed to include quite a few demographic groups: Children, Men, (mostly) Women, African-Americans, 50+, and they’re all so happy!! One suggestion I like is that if congregational is more aspirational than real, “Start making it real!” Obviously churches can’t drag ethnic diversity in off the street, but they can develop an attitude of diversity by deliberately including diversity in everything we do. If we begin with intentionally including generational and gender diversity on committees and ministry teams, we’ll develop an attitude toward inclusiveness that will prove invaluable when connecting with those of other ethnic backgrounds. Don’t let pictures be the only expression of the church’s aspirations for diversity. This is a topic I’m sure we’ll explore further in later posts. Churches that are racially integrated really should get that message out. Remember, 93% of churches are not! But what’s the best way of letting our communities know who we are? This article was originally posted on the website www.GodMeetsBall.com in May 2013. Since football has become such a big part of the Christmas season in the US I thought it would be appropriate to share these thoughts here. I hope all my readers have a wonderful Christmas with those you love. This might seem strange to many people today, but I graduated high school the year before and I don’t remember ever having a conversation about racism and the hurt it causes. There may have been other events that also placed racism on the public consciousness, but for young white males who admired Winmar as a superbly skilled football player, this image made an impact. In the USA Jackie Robinson is honoured as the first black player in Major League Baseball in 1947. Just as the AFL now has an indigenous round each year, MLB also celebrates Jackie Robinson Day annually. Sports have always had a close connection to race relations. Sometimes sports leagues, players and fans have disgraced themselves, but sports have also made some important contributions in race relations. Sometimes these improvements have come through official actions and at other times by unofficial events. It’s not Tiger’s way to bring attention to any aspect of his racial heritage. His aim is to transcend race through excellence as a professional golfer. He reaches for a higher plateau that is post-racial in a way that not even President Barack Obama could ever attain as a self-identified African-American. One of the cruel ironies of Tiger’s hope for racial transcendence in a sport played predominantly by whites is that he has been both a symbol of racial harmony and a polarizing force along racial lines. Apart from the statements made on the field, sports provide a unifying rallying cry for people from all backgrounds. Whether listening to a radio in the poorest hovel, or sipping wine in a corporate box, people connect by supporting the same team. When I worked as a college minister in Melbourne, Australia, we had a large group of international students attending our church. I encouraged them to pick a football team, any team, and even if they weren’t interested at all, keep track of the team’s season from a distance. This would help them fit in with the local people they met and serve as a great conversation filler. Everyone has a favourite team. Even if your team is different to mine, at least an interest in the sport provides a commonality. So if sports can unify fans across racial, educational and financial divides. And if sports can make strong statements opposing racism that impact society as a whole. The church has a lot of work to do to match the camaraderie of sports teams. How do we welcome people different from ourselves? Are our friends mostly like us, or do they reflect our community? Shouldn’t the church be ahead of the local sports team, which basically are businesses, in acting as instruments of Godly social change? Even today, many church growth consultants promote the idea that homogenous churches will grow more quickly than integrated, diverse congregations. I know churches that insist that they need to be racially black, or white or Chinese, or Latino to help them serve that particular ethnic community. In Matthew 6:10 Jesus prays, “May your will be done on earth as it is in heaven.” What is God’s will for race relations and the church? Let’s answer that by looking at heaven. Revelation 7:9 describes “a great multitude that no one could count, from every nation, tribe, people, and language standing before the throne an in front of the lamb” praising God. Wouldn’t it be wonderful if that described our churches, “on earth as it is in heaven”?